The start of the 2019 Free Agency period is just around the corner and the negotiations period has officially begun. With the season just a few months away, here’s what you need to know about Free Agency. At this point, teams are able to begin negotiating with their Core and Reserved Players and any Restricted and Unrestricted Free Agents. This is when all player designations will be announced. Teams and players can officially finalize deals to sign contracts and offer sheets. Core Players: The Core designation gives a team exclusive negotiating rights with a player. Players can receive a Core designation only 4 times in their career. Reserved Players: Players with 3 or fewer years of service. The player’s prior team has exclusive negotiating rights. Restricted Free Agents: Players with 4 or 5 years of service are considered to be Restricted Free Agents. Restricted free agency gives the player’s prior team the right to keep the player by matching a contract offer the player signs with another team (Right of First Refusal). If the player signs a contract offer with another team, the player’s prior team has four days from the date it receives the offer to determine whether it wishes to match. If the offer is matched, the player will remain with her team. If the offer is not matched within the four-day period, the player will be under contract with the offering team. Unrestricted Free Agents: An unrestricted free agent is free to sign with any team as long as she is not designated a Core Player by her prior team. 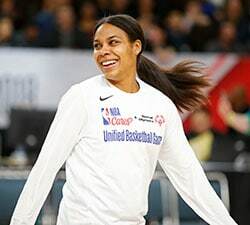 It came as no surprise that major players like Maya Moore, Tina Charles and DeWanna Bonner received the Core Player designation, meaning their respective teams will have the exclusive negotiating rights for 2019. But around the league, there are notable Unrestricted and Restricted Free Agents that could shake things up for the upcoming season. 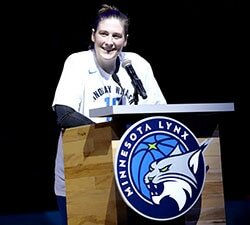 Seimone Augustus and Rebekkah Brunson have become staple players in Minnesota, both having been a part of the four Lynx championship teams (2011, 2013, 2015, 2017). They have already cemented their place in WNBA history — Brunson as the league’s only five-time champion and all-time leading rebounder, and Augustus as a WNBA Top 20@20 member. As 10+ year veterans, each possesses a level of experience most teams would dream of having. The Mystics made history of their own last season with their first WNBA Finals appearance. A major piece of their offensive puzzle was breakout guard Natasha Cloud. She was instrumental in facilitating the Mystics’ signature ball movement in 2018, averaging 4.6 assists (9th in league) and sporting a 2.8 assist/turnover ratio. Natasha Cloud has played her entire four-year career with Washington after being drafted No. 15 overall in 2015. 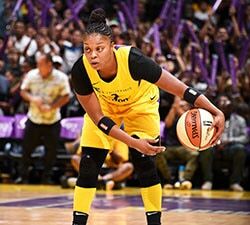 In what will represent a key move for the Sparks and first-year head coach Derek Fisher, the Sparks will take on the task of re-signing Restricted Free Agent Chelsea Gray. The young star out of Duke has become well-known for her ability to see the floor and make highlight-reel passes, not to mention the fact that she averaged a career-high 14.9 PPG last season and consistently performed in the clutch. Gray’s star appears to be on the rise. Since Tina Charles was designated as a Core Player for the Liberty, that opened it up for Epiphanny Prince to become an Unrestricted Free Agent, meaning the 9-year veteran is able to sign with any team. Already an adept ball-handler, Prince shot a career-high 42 percent from beyond-the-arc in 16 games last season, showing signs of rounding out her game. While it was Quigley who was given the Core Player designation last year, it’s Courtney Vandersloot that received it this year in Chicago. Quigley has played the last six years in Chicago and would project to be a major part of new head coach James Wade’s offense if she returned. Otherwise, she’s the top sharpshooter available on the market. @WNBA social channels and each team’s individual social channels will provide breaking news and updates during the Free Agency period. Updates will be made on our 2019 Free Agency tracker, as well.